Pahela Falgun and Valentine’s Day are celebrated around the same time. Charka, a leading fashion house, has designed exclusive collections keeping both these days in mind. Exquisite kurti, sari, salwar kameez, punjabi, and fotua of vibrant colours such as orange, yellow, various shades of green, black, red, et al are available. There are colourful collections for kids as well that includes fotua and salwar kameez. A touch of modern refinement will be conspicuous with exotic patterns and diverse cutting designs. The price ranges from Tk. 200 to Tk. 11,500. 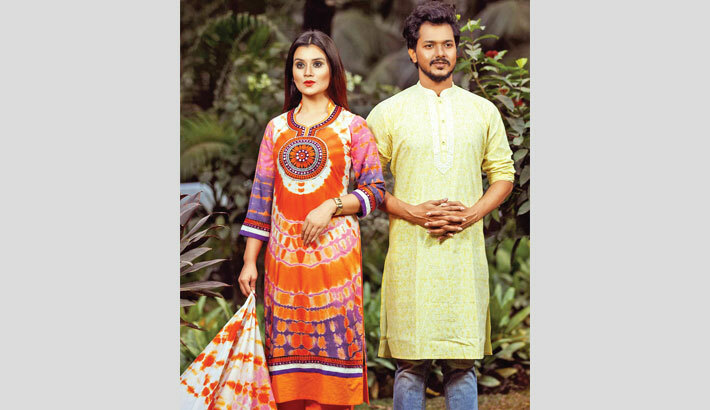 You can purchase Charka’s products in their showrooms located at Orchard Point (Dhanmondi 7) and Anam Rangs Plaza (Sat Masjid Road, Dhanmondi).